I fell in love with the viola when I first heard it at ten years old and have played it ever since, moving through my school's orchestra program and into college where I studied classical performance. Once I left school, I began playing with rock bands, noise ensembles, and avant-garde improvisers, some of them arguably unlistenable and some of them truly sublime. 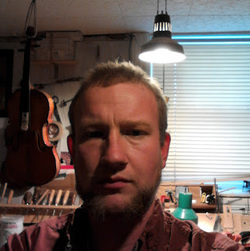 I began working as a luthier in 1999 when I brought my viola into Axelrod Music (once Providence's oldest music store) to have a crack repaired. There I met the wonderful Gene Malone who had been working at Axelrod since the 1950's. I apprenticed with Gene for 5 years. Axelrod had a very large rental program, and I was able to cut my teeth on hundreds of instruments in various states of destruction and disrepair. At this point, I have seen most of the things that can go wrong with an instrument. In 2004, I began working out of my own shop. I have attended the University of New Hampshire Summer Violin Program and learned about new facets of technique and craft that I can bring to my work. I am excited to know that there will always be room to improve my understanding and abilities as a luthier. I am passionate about sharing the experience of music either by teaching people to play, playing alongside them or making their instruments play as well as possible.